Tile And Grout Cleaning Frankston offers best cleaning, repairing and sealing services. Expert Tile Cleaners are ready to help you! Contact us today on 1300068194 for same day Tile And Grout Cleaning Frankston. Your home unlike many of the homes today must be having a variety of floor and wall tile coverings. Tile has a wide range and now covers more than just your bathroom area, your tub and shower walls but other areas too. Tile flooring has turned out to be the most popular surfaces in foyers, family rooms, kitchens, utility rooms, porches etc. Both inside and outside your house. Like any other surface, this area too requires ongoing daily, weekly or monthly maintenance using measures like vacuuming, mopping, scrubbing and sweeping. However using cleaning techniques like toothbrush and consumer-grade cleaners and a few hours of labor can’t take you farther. That’s why you need the expert knowledge on Tile and Grout Cleaning and professional tile cleaning services. At Toms Tile Cleaning Frankston offer wide variety of powerful cleaning solutions which is designed in order to remove buildups, spots, soils, oils and stains using high pressure rinse and extraction in order to leave your tile and grout better. Our Professional tile cleaners and grout cleaning measures won’t take enough time and can clean the tiles and seal them same day, and your freshly cleaned floors are then ready to shine. Toms Tile Cleaning and Grout cleaners penetrate deeply into the porous surface of the tile and grout affected and removes the soil which helps them eliminating the mildew, bacteria’s, other contaminants and fungus. Our professional Tile and Grout cleaning methods helps in resisting microbial contamination in order to leave the tile and grout clean and healthy as possible. We at Toms Tile Grout Cleaning Frankston provide not only the best grout cleaner process, but we make sure that the tile cleaning and grout cleaning services we provide is driven by knowledge of professionals so that they can easily identify your needs, and able to opt the proper products and equipments in order to deliver results that are way far than their expectations. First, we remove and take necessary precautions to protect any furnishings in areas to be cleaned. At Toms Tile and Grout Cleaning Frankston, we follow step by step process which includes inspection of the area which could be your house or work space, to ensure the damaged section and how to work on it effectively with in your budget. For Tile Grout Cleaner and Tile Floor Cleaner we initially apply the alkaline based solution to emulsify and help in uplifting the greasy soils from the tiles. We perform manual brushing which is immediately followed by our cleaning tools; we use our high power machinery for the optimum results. We ensure that we cover every edge and corner of the affected area. We ensure and supervise that the process is been followed properly. Once the process is been completed we use water sealer so that in future if the oils come in contact with the floor it remains on the top of both the tiles and grout area. This technique for Tile and Grout Cleaning helps to maintain the composition of tile and grout intact and gives a natural look. This cleaning process gives an entirely new look to your floor. While performing the process we do not make use of any dangerous acids and we only use products that are safe for the environment. Toms Tile Cleaners are completely trained and professional to assist you to clean and repair your indoor and outdoor tile premises. Tile Steam cleaning is one of the best ways to clean tile floors we follow at Toms Tile Cleaning. It helps in cleaning porous tiles and smoothen it and cleanses the grout lines. The tiles surfaces are usually hard to clean because of its pores and crevices, but when hot steam flows deep into the tiles nook and cranny it effectively loosen all the dirt, grease and grime. Also, when specialized and high-quality floor tool is been used to restore the shine, maintaining the tiles becomes easier. The best way to clean grout effectively is using grout steam cleaner. Our professional Tile Cleaning technique attaches a small brush to the equipment and begins the steaming straight onto the affected grout line. We use the brush to lightly scrub so that the dirt will get lifted from the grout effortlessly. Our Tile cleaners finish the job by attaching a cloth to the tool and pass it over the entire surface in order to wipe away the excess dirt. Grout Steam cleaner offers you the perfect results for hard to clean surfaces. If you wanted to transform the look of your tiles and grout area, feel free to reach us out at Toms Tiles Cleaning Services for Floor Tile Cleaning, Pool Cleaning, Bathtub Cleaning and Grout Cleaning. 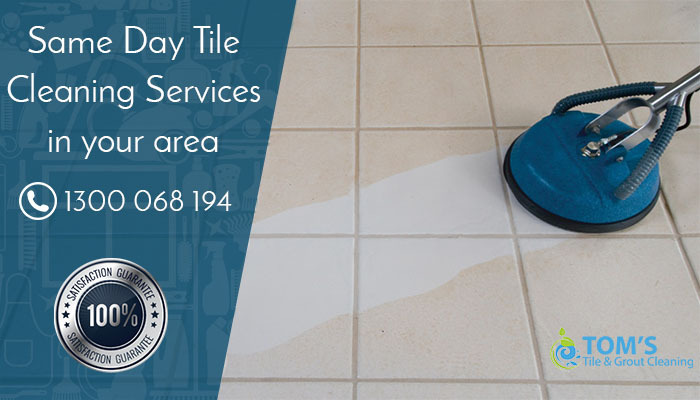 We are available for 24/7, if you have any emergency then we provide same day tile cleaning services in Melbourne, Sydney and Brisbane. Just call us on 1300068194. We believe in maintaining our relationships with our Customers beyond the cleaning services by providing them healthier and optimal services. We believe in the saying that more often they call us, less the work they have to deal with. In order to seal the deal with Professional Tile Cleaning send your queries now or reach to our website link to get the best tile cleaning services at your door with exciting offers. We are eager to assist you in any type of Cleaning. Toms Tile and Grout Cleaning Frankston is your local specialist for tile cleaning, stone cleaning, grout cleaning, tile stripping, tile sealing, tile regrouting, grout color sealing and covering the restoration of all types of stone and tiled flooring. Toms trained and experienced tile cleaners in Melbourne, Sydney & Brisbane can efficiently renew your tiles.